(Nanowerk News) Researchers from IMDEA-Nanociencia Institute and from Autonoma and Complutense Universities of Madrid (Spain) have managed to give graphene magnetic properties. The breakthrough, published in the journal Nature Physics ("Long-range magnetic order in a purely organic 2D layer adsorbed on epitaxial graphene"), opens the door to the development of graphene-based spintronic devices, that is, devices based on the spin or rotation of the electron, and could transform the electronics industry. This is revealed in the study that the Madrid Institute for Advanced Studies in Nanoscience (IMDEA-Nanociencia) and Autonoma Autonomous (UAM) and Complutense (UCM) universities of Madrid have just published in the Nature Physics journal. 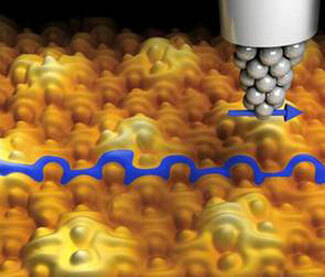 Researchers have managed to create a hybrid surface from this material that behaves as a magnet. "In spite of the huge efforts to date of scientists all over the world, it has not been possible to add the magnetic properties required to develop graphene-based spintronics. However these results pave the way to this possibility," highlights Prof. Rodolfo Miranda, Director of IMDEA-Nanociencia. In order to develop a graphene-based spintronic device, the challenge was to 'magnetise' the material, and researchers from Madrid have found the way through the quantum and nanoscience world. The technique involves growing an ultra perfect grapheme film over a ruthenium single crystal inside an ultra high vacuum chamber where organic molecules of tetracyano-p-quinodimethane (TCNQ) are evaporated on the grapheme surface. TCNQ is a molecule that acts as a semiconductor at very low temperatures in certain compounds. 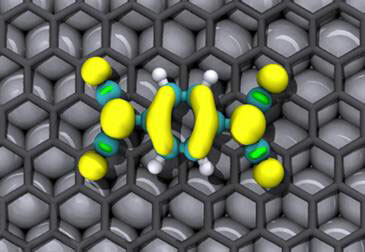 "We have proved in experiments how the structure of the TCNQ molecules over graphene acquireslong-range magnetic order, with electrons positioned in different bands according to their spin," clarifies Prof. Amadeo L. Vázquez de Parga.